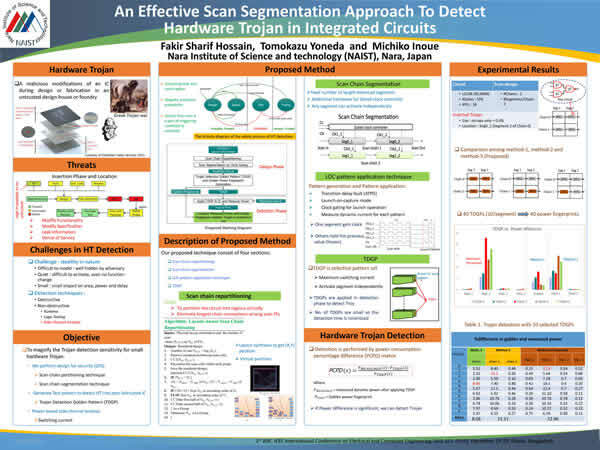 " An Effective Scan Segmentation Approach to Detect Hardware Trojan in Integrated Circuit"
Malicious alternation in hardware at any face of chip manufacturing flow has drawn the attention of government agencies and the semiconductor industry. The added functionality, known as hardware Trojan, poses major detection and isolation challenges. In this paper, we present a hardware Trojan detection technique that magnifies the detection sensitivity for small Trojan in power-based side-channel analysis. A scan segmentation approach with a modified LOC test pattern application method is proposed so as to maximize dynamic power consumption of any target region. We evaluate our approach on ISCAS89 benchmark circuit to demonstrate its effectiveness in side-channel analysis. That is a great owner for me to receive one of the prestigious awards from this platform. 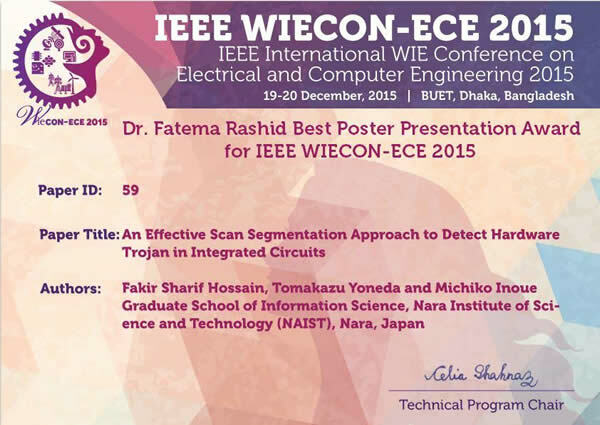 Out of 48 high-level technical posters from researchers from various countries, I won the award. >> ディペンダブルシステム学研究室 Dependable System lab.